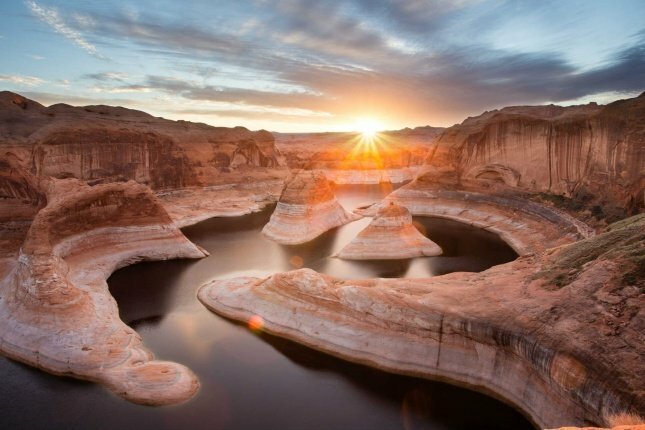 The grand prize winning photo in the 2015 National Park Foundation’s “Share the Experience” photo contest went to a sunrise shot at Glen Canyon National Recreation Area in Utah. The majestic photo taken at just the right time of year when the sun rises through Reflection Canyon and the water levels were low enough to reveal the layers in the rock was a result of meticulous research by thee photographer Yang Lu. Yang told contest officials he reviewed water level data and studied maps of the area before making the two-day backpacking trip. Every winner the National Park Foundation holds a photo contest for $10,000 and other prizes, with the 2016 contest currently ongoing. Other winners announced this week included a photo of bighorn sheep at Joshua Tree, a Death Valley landscape, the night sky at Badlands and an up-close beetle at Saguaro, among others, all of which were taken at a National Park. This month also marked National Park Week with free admission and other deals.